Since March, 2007, the Sharon Kleyne Hour Power of Water radio talk show has interviewed numerous guests who offered tips to prevent "computer eye strain" (also called "computer vision syndrome," "CVS," or computer eye strain). Symptoms are experienced by a surprisingly large percentage of people who work at computers. Computer eye strain and dry eye symptoms should never be ignored. Dry eye symptoms could lead to chronic dry eye, eyelid inflammation, corneal ulceration, impaired vision and numerous eye diseases. Symptoms include red, burning and itchy eyes, blurred vision, eye twitching, headaches and impaired sleep. Vision care experts agree that the #1 tip to prevent or minimize computer eye strain is educating yourself about the problem. The #2 tip is taking personal responsibility to proactively implement the eye care tips described below. The #3 tip for keeping eyes all-naturally wet, moist and humid is to always have Nature's Tears® EyeMist® near your computer. Apply as often as desired without the inconvenience of eye drops (Eye drops, applied too frequently, can flood and wash away the eye's natural tear film. See www.naturestears.com and click on "Dry Eye"). Nature's Tears EyeMist, a personal hand-held eye humidifying device, is all-natural tissue culture water, pH balanced and 100% safe. Tips to prevent and minimize computer eye strain. In addition to preventing computer eye strain and dry eye, many of these tips help prevent other computer related conditions such as gout, allergies, carpal tunnel syndrome and weight gain (abdominal swelling). Keep an all natural, 100% water eye mist beside your computer. Whenever you feel eye discomfort, mist the air in front of your eyes for two seconds. Sharon Kleyne recommends Nature's Tears EyeMist for this, available on www.Amazon.com or www.naturestears.com. Drink eight to ten glasses of water a day and drink water from a glass while you work. Keep a bowl of water or a plant near your desk to humidify the air. Crack a window to let in fresh, humid air from the outdoors (forced-air heating and cooling re-circulates dehydrating bacteria and skin flora). "Eye Healthy" diet choices include dark green leafy vegetables (spinach, kale, arugula, broccoli leaves), foods with omega-3 fatty acids (fish and flaxseed oil) and carrots. While working, avoid dehydrating substances such as alcohol, coffee, energy drinks, refined sugar products and cigarette smoke. Avoid staying up late at night on the computer if you will be working at a computer in the morning. Several times per hour, to relax and exercise your eyes, look around the room at objects of varying distances. Take scheduled breaks away from your desk, outdoors if possible. Make a conscious effort to maintain your blink rate (computer use can drop your reflexive blink rate from 30 to three times a minute). Tape the word "BLINK" on your monitor. The more you blink, the moister your eyes. Position your chair as high as possible with respect to the monitor. The resultant lowering of eyelids can drastically reduce tear film moisture evaporation. To reduce screen glare, position your computer so windows are at the sides rather than in front or back. Adjust window blinds so bright sunlight is away from screen and eyes. If possible, turn off fluorescent lights and use a less intense desk lamp. An eye care professional may prescribe special "computer glasses" or, for severe dry eye, moisture retaining eyeglass lenses. Wear sunglasses outdoors - solar radiation dehydrates the eyes. If you have a cathode tube monitor, consider attaching a glare-blocking hood or filter to the screen and set the "Refresh Rate" as high as you can (over 85). Take daily showers with plenty of steam and moisture penetrating eyes, skin and breathing passages. An occasional hot body bath with a cup of Epsom salt. Will benefit eyes and eyelids and reduces stress. Avoid stress and get adequate sleep and fresh air exercise. Poor sleep and elevated stress can be dehydrating and cause dry eye symptoms. Listen to the Sharon Kleyne Hour Power of Water Mondays, 10 a.m., PST/PDT. The syndicated talk show is heard on Voice America/World Talk Radio, Green Talk Network and Apple iTunes. Go to www.SharonKleyneHour.com for podcasts of past shows or written summaries. 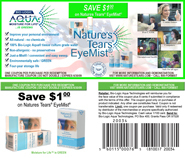 Also visit www.naturestears.com, whatistheeye.wordpress.com, "Nature's Tears EyeMist" on Facebook and "Bio-Logic Aqua" on Twitter. Sponsored by Nature's Tears EyeMist.